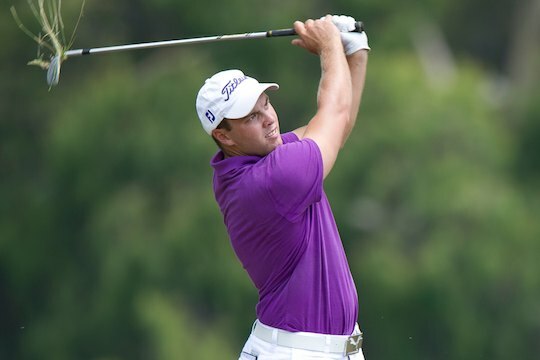 New Zealand Open Champion Daniel Nisbet lit up the Palmerston Golf Course as he fired into the early lead at the MMC Northern Territory PGA Championship. Teeing off the 10th hole in the morning field; Nisbet cruised around the back-9 in 2-under the card. But it was his second nine, the front-9, where he really caught fire. Recording four consecutive birdies the Queenslander was 6-under before adding a final birdie to his card at the 9th hole to sign for an opening round of 7-under 64. “I was a bit aggressive out there and it paid off. I was hitting my driver really well so I am happy,” said Nisbet, who was bogey-free. Nisbet’s performance came as somewhat of a surprise after missing the cut in this tournament the past two years. “I was saying in the lead up that I have never played that well here and I have missed the cut. So it was nice to get the monkey off my back and shoot a low one. Hopefully, I can do it another three times,” added Nisbet. Playing in the afternoon field, 23-year-old Kade McBride pushed through sunstroke to shoot 6-under 65. “I am happy with how I handled the back-9, it got pretty tough out there but I managed to salvage it pretty well and came home with a good score,” said McBride. South Australian Peter Cooke, who fired 5-under 66, had to forgo a practice round when his golf clubs didn’t arrive until the eve of the tournament. “My clubs didn’t arrive on my flight Tuesday night but luckily they arrived last night. I didn’t get to do any practice so I was lucky that I managed to pull something out this morning,” said Cooke. Joining Cooke, tied third on the leaderboard, is Damien Jordan who enjoyed a good day with the flat stick. Jordan, who served two tours of Iraq with the Australian Army, was quick to thank the 25 American Marines who are volunteering at the tournament this week whilst deployed in Darwin for Exercise Pitch Black, an international air force exercise held in the Top End every two years. “It was cool to see a few of the Marines around the course. I spent a bit of time with them in Iraq, they are good lads,” added Jordan. Also opening with 5-under the card were Michael Sim (WA), Adam Burdett (VIC), Brad Moules (SA) and Campbell Rawson (NZ). Defending champion Travis Smyth had an interesting day on course, finding just three fairways the rookie pro managed to shoot 4-under 67 including a lone bogey. “I wanted to get off to a good start like last year and I think 4-under has met that expectation,” said Smyth. “I wasn’t that far off but I only hit three fairways. The trees really overhang on this course so I was playing a lot of punch, low fade and low draw shots. Joining Smyth on 4-under the card and rounding out the top-10 are Tim Stewart (NSW), Jack Wilson (VIC), Maverick Antcliff (QLD), Jake Higginbottom (NSW), Braden Becker (WA) and Scott Arnold (NSW).